bp Tuesday • January 9 • 2018 Volume 85• Number 02 INSIDE: n Menards	Presorted Standard US Postage Paid Permit #8 ECRWSS Vermillion, SD n Bomgaars n Employment Postal Patron Local Since 1934 201 W. Cherry n Vermillion, SD 57069 n Phone: 605-624-4429 n Fax: 605-624-2696 n www.broadcasteronline.com MAKE YOUR MOVE SM to Yankton’s Foot and Ankle Experts 25% of your bones are found in your feet. Source: foot.com Using a podiatrist in your diabetic foot care can reduce your amputation risk by 85% Source: American Podiatric Medical Association Total Foot and Ankle Care • Diabetic shoes and prescription inserts • Foot and ankle fracture repair, reconstruction and surgery • Flat foot repair • Pediatric surgery and foot care • Rheumatoid foot and ankle surgery and reconstruction • Sports medicine Terence Pedersen, DPM Christine Wiarda, DPM From sports injuries to foot and ankle surgery to diabetic foot, Avera Medical Group Podiatry in Yankton cares for the entire spectrum of foot, ankle and lower leg problems. We use only the best in treatment methods to care for families right here in Yankton. We also care for sprains, tendonitis, diabetic ulcers and wounds, bunions, hammertoes, heel spurs, ingrown toenails, warts and other soft tissue problems. 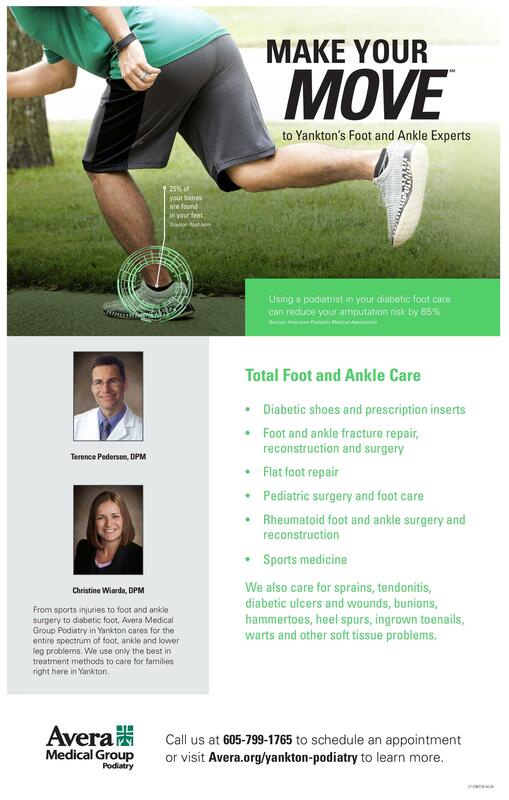 Call us at 605-799-1765 to schedule an appointment or visit Avera.org/yankton-podiatry to learn more. 17-ORTH-8126 OUR DATA SPEAKS VOLUMES What does this mean? It means that, as a publication audited by Circulation Verification Council (CVC), we have a clear understanding of our impact, including the number of households we reach, how much we’re read and our influence on purchasing decisions. When it comes to serving readers and advertisers, CVC is the standard. Put your trust in the Broadcaster Press, audited by CVC. Broadcaster Press WORLD’SGREATEST SALE 109 East Third, Yankton • 605.665.4416 Mon.-Fri. 10-6, Sat. 10-5, Evenings by Appt. www.hatchfurniture.com EVERYTHING IS ON SALE!